Come melt your face off with our latest jet engine addition to SimpleRockets 2. Put the throttle lever to the metal, and fulfill your need for speed. Read more about the jet engines here. 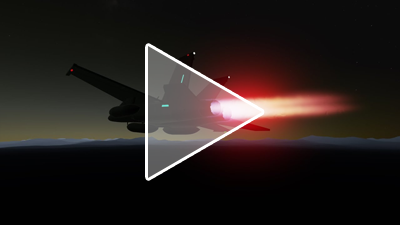 Realistic simulation allows you to tweak their size, bypass ratio, compression ratio and afterburner and see how it affects performance. Cycle through the different visual styles for nozzles, fans, inlet cones, and shrouds (or remove their shroud and see their naked core). Added quality settings for Image Effects: Saturation, Contrast, Sharpness, Sun Flare, etc. Reduced the time required to save a craft, particularly for high part count crafts. Added a 'Show Hidden Properties' option in the tinker panel to show hidden part properties on some modifiers. Improved sun rendering for low quality settings. Emissive-ness of paint can now be increased beyond 100% for a glow like effect if bloom is enabled. Added Prevent Part Selection (bound to left shift key) that you can hold to rotate and pan the camera without selecting/moving parts. Added ability to disconnect and reconnect a part in the designer by pressing 'K'. Added quality setting for the main menu sun. Added angular velocity and acceleration to the Flight View inspector. Added current fuel usage to inspector for engines during flight. Activation groups used by input controllers are now recognized by the designer part highlighter and the flight scene input panel list. Added Deflection Angle and Deflection Speed to control surface part properties. Fixed a bug that could cause terrain to not render in some situations (particularly for very large planets such as Tydos). Output correct power usage for command pod gyroscope. Fixed bug preventing flight state from being saved outside flight scene such as when deleting crafts from "Resume Flight" in the menu scene. Fixed a bug where RCS would continue to fire when in Translation mode when the heading was unlocked. Fixed a bug where gravity was not updated while in time warp. Fixed a bug where the tutorial could not be completed if the Part Lift Forces setting was disabled. Fixed a bug where the texture style, offset, and tile spinners could disappear when selecting a part. Fixed a bug where the rotate and nudge tools could encounter errors while rotating parts that were disconnected with symmetry enabled. Fixed a bug where fuel tanks would not correctly update connected parts after changing their size. Fixed a bug where fuel tanks and nose cones would not correctly calculate their fuel and mass when added in the designer until connected to the craft. Fixed a bug that caused satellites with several docked crafts to break apart in orbit. Fixed a bug that could cause an infinite loop in very unusual circumstances. Fixed a bug where crafts would start spinning after docking. Fixed a bug where the sun would disappear when the player's craft got below 140,000km. Fixed a bug where the sun was not the correct size when viewed in the Flight View. Fixed a bug where some engine nozzles would not correctly calculate their gimbal direction for roll. Fixed a bug where cargo bay doors did not update correctly after changing its texture or resizing it with the part shape tool. Fixed a bug where the cargo bays did not immediately respond to changing their open angle in the designer. Fixed a bug where the cargo bays did not start open immediately when reloading a flight state where the cargo bays were active. Fixed a bug where CoM, CoL, and CoT did not update when nudging parts with keyboard shortcuts. Fixed a bug where the relaunch dialog did not show the correct loading screen when reloading the craft at a launch location on a different planet. Fixed a bug where the designer would not calculate a part's CoM correctly if the part had overridden it's local CoM. Fixed a bug where the docking missions would fail to recognize, in some circumstances, that the player had successfully docked. Fixed a bug where rocket engines and jet engines would work when underwater. Fixed a bug where rocket engines where misreporting their fuel usage when not at 100% throttle. Fixed a bug where the volume of a fuel tank was not affected by its corner radiuses. 0 Cargo Bay open angle does not update in designer. Thanks for all this crazy stuff! Fixed a bug where "crafts would start spinning after docking." I love the "yes" option for afterburners. @AnotherFireFox The terrain rendering issue was a bug with the culling algorithm, which attempts to not render stuff that shouldn't be visible. On larger planets, the bug was easier to encounter. It would result in terrain quads disappearing because it thought you couldn't see them, even though you should have been able to. @AnotherFireFox Currently only Input Controllers have 'hidden' properties. We hope to include more properties on more parts in time. These 'hidden' properties are just the normal stuff you could always tweak via XML editing, now there is just an easier, in-game way to do it. @AnotherFireFox Show hidden properties shows hidden properties on certain parts, like the wheels for example. Not everything has hidden properties to be shown as far as I know so far. I agree with @WNP78 about the engines. Excellent work on the engines! Though, they are a little... quiet. Also, it would be good to have a way to have thrust vectoring, but only on the "Military" nozzle type. I second having a way to make thrust vectored jet engines without using rotators to move the entire engine. This is important right now because of how wobbly the rotators and things are when heavy things are attached. I hope liquid and solid engines to have the flexibility of this new jet engines, it would be game changing. Question: What does it mean "fixed terrain render in big planets"? I had to increase subdivision levels for my RSS planets. Is something changed? "Show Hidden Properties" doesn't change tinker panel. Changing Jet Engine size doesn't update attach node just like Fuel Tank did.